People talk about Iran a lot. During the U.S. Presidential debates, Iran's pending ability to construct nuclear weapons was a major concern. Despite the objection of Mitt Romney, scientific development proceeds in the Middle Eastern nation. Today, Iran announced on its state television network that it successfully launched a monkey into outer space as part of its burgeoning space program. Iran plans to eventually run manned space mission, and today's flight is just another step in that process. The monkey rode on a rocket - called a PishGam, or Explorer - reaching a height of 120 kilometers. That height puts the rocket firmly in Earth's thermosphere, but it didn't reach as high as the orbit of the International Space Station (~370 km). The monkey returned to Earth safely. In 2010, Iran stated it launched a rocket which held various creatures including a mouse, a turtle and worms. 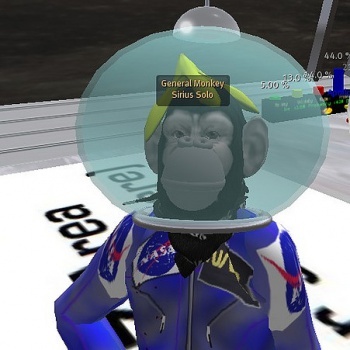 The monkey was the first attempt to send a primate into space, and the success might mean Iran plans a manned space flight soon. Of course, that has the United States and its allies feeling a bit cautious. I get the nervousness, but part of me wonders why it was OK for one nation to have nukes and a space program - i.e. the U.S. - and totally unacceptable for another. Is it terrible for the world to have access to all technology? Isn't that what the Internet and globalization and the spread of ideas is all about? Why can't we act more like we're in Star Trek?